Long, lean, and muscular, the third-generation Corvette's looks were backed up by the biggest and most powerful engines GM had ever produced. But it would be short-lived - insurance premiums, emission laws, and safety concerns came about, and the Corvette would soon begin its transformation from ground-shaking bruiser to world-class sports car. Modeled after Chevrolet's Mako Shark 2 show car, the fiberglass-bodied Corvette rolled on same chassis as the 1963-1967 models, with only minor modifications. The new body required changing the height and position of the body mount brackets, which are on either side of the frame. For additional strength, angled channel brackets were added from the inside of the frame rails to the top of the differential carrier front cross-member. Additionally, the original frame length of 149.86 inches was shortened to 146.875 inches. Maximum width (between the center of the three body mount bracket holes) was shortened from 55.14 inches to 53 inches. All-wheel independent suspension, also carried over from the previous generation, used upper and lower control-arms with coil springs up front. The rear used a lateral leaf spring and trailing arms. U-jointed half-shafts sent power to the rear wheels and also served as upper control links. Four-wheel disc brakes were also retained from the last-generation. The all-new body allowed use of wider seven-inch wheels, which improved handling. The coupe's structural network was made of steel and formed the backbone of the new body, with a center roof-beam giving additional reinforcement for the removable T-top roof panels. The windshield's upper, lower, and side frames were also steel. Rear window glass was removable. The convertible's exterior lines were enhanced by the deletion of side vent-windows. A soft-top folded down into a rear-hinged panel, with a removable hardtop optional. Inside, the instrument panel was completely new, with speedometer and tachometer prominently facing the driver. Although exterior dimensions were larger, interior room was smaller and seats narrower. To accommodate the lower roofline, seat-backs were more inclined. Behind the seats, a small luggage area contained three recessed compartments. One was a glove box, another held the tire jack, and the third housed the battery. The spare tire was mounted horizontally under the gas tank in a circular fiberglass pocket. Base engine was a 300-horsepower, 327ci small-block V8, with an available 350 horsepower version. A floor-shifted three-speed manual transmission came standard, with either a Muncie four-speed manual or GM's new three-speed automatic optional. Chevrolet's 427ci big-block V8 motor came in four versions. The L-36 carried a single four-barrel carburetor, had 10.25:1 compression ratio and produced 390 horsepower. The L-68 motor, which had three two-barrel carburetors for induction, was rated at 400-horsepower. Also using three two-barrel carburetors was the L-71 motor, which had 11:1 CR and produced 435-horsepower. The rarest and most powerful of C3 engine options was the L-88 big-block, a 427ci motor with 12.5:1 compression, large-valve aluminum cylinder heads, and an 850-cfm carburetor. Designed for racers but sold as a regular production option, the L88's real output was intentionally hidden from the safety-conscious public, and conservatively rated at 430 horsepower. Most Corvette enthusiasts agree the real horsepower figure was nearer 550. Big-block Vettes are easily spotted by the large bulge on the hood. Flush-mounted door handles and body chrome distinguished the 1969 Corvette from the 1968 model. Complying with a federal mandate, the ignition switch, previously dash-mounted, was now incorporated into the steering column lock assembly. Handling was improved by stiffening the frame and increasing standard rim width to eight inches. Chevy's small-block V-8 got an increase in displacement, its third since introduced in 1955. By lengthening stroke from 3.25 to 3.48 inches and leaving cylinder bore at 4.00-inch, 350 cubic-inches was attained. Torque was increased, horsepower ratings remained the same. Big-block engine options remained unchanged, with ratings from 390 to 435 horsepower. The special aluminum-head L-88 engine, an optional $1,032, was available a second and final year. 1969 would be the last year for multi-carb motors. To make up lost time due to a worker's strike earlier in the year, Chevrolet extended production two extra months. 1969 would be the best sales year yet, with 38,762 units, beating last years production total of 28,566. A minor front makeover included a revised grille and side vents. Front turn-signal lights were now square, with rear exhaust tips changed from round to rectangular. The wider eight-inch wheels from last year were found to cause stone damage on the back edges of the wheel openings. To prevent this, flares were added to the rear portion of the fenders. Chevy's big-block 427 motor received an increase in stroke length, from 3.76 to 4.0 inches, putting displacement at 454ci. Cylinder bore remained at 4.25 inches. The LS5 big-block, topped by a single four-barrel, produced 390 horsepower with 500 lb/ft of torque. Also offered was the LS7, which had 11.25:1 compression, making 460 horsepower and 490 lb/ft of torque. Chevy's 350ci small-block motor, offered in 300 and 350 horsepower output, were now joined by a third, more powerful version. The LT-1 350, designed by Zora-Arkus Duntov, was a big step in helping the Corvette become a better-balanced performance car. The lower end featured four-bolt main caps, forged crankshaft and connecting rods, with 11:1 compression forged pistons. Large-valve heads and a solid-lifter, high-lift camshaft with lots of overlap gave the LT-1 motor a distinctive lumpy idle. An aluminum high-rise dual-plane manifold was topped with an 800-cfm four-barrel carburetor. Ignition system was GM's latest transistorized Delco unit. Offered with a four-speed manual transmission only, output was 370-horsepower at 6,000 rpm with 380 pound-feet of torque at 4,000 rpm. An LT1 Corvette was nearly as quick as a big-block Vette, with better agility and handling. Because 1970 model-year production did not begin until January, only 17,316 Corvettes were produced this year. All engines now ran on lower-octane unleaded fuel. In order to comply with new emissions standards, GM reduced compression ratios on all engines. The base Corvette 350ci engine dropped from 10.25:1 to 8.5:1 CR, with horsepower dropping from 300 to 270. The LT-1, still red-lining at 6500 rpm, put out 330-horsepower. 1971 was the last year Chevy's Big-Block motor made big power. The 454 LS6 produced 425-horsepower with 475 lb-ft of torque, with the LS5 version making 365-horsepower and 465 lb-ft of torque. Corvette gas mileage was still in the 9-15 mpg range. With emission regulations and no-lead gas already bringing about lower compression ratios, Corvette's standard 350ci motor was rated at 200 horsepower. The LT1 350, now red-lining at 5600 rpm, made 255 horsepower. The LS5 454 was the sole big-block offered, putting out 270 horsepower. This was the final year for front and rear chrome bumpers, as well as the last year of removable rear window glass in the coupes. With the uncomplimentary distinction of being the most stolen car in America, Corvettes were now equipped with an anti-theft alarm. 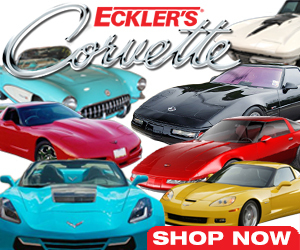 Like all performance-cars, Corvettes faced tough times in the early seventies. Safety concerns and emission laws would take their toll on performance and popularity, and the downward trend in horsepower wouldn't come back for two decades. The Corvette did have an advantage over most of their competitors, and that was its parent company, who would respond to the upcoming challenges with clever styling and engineering.